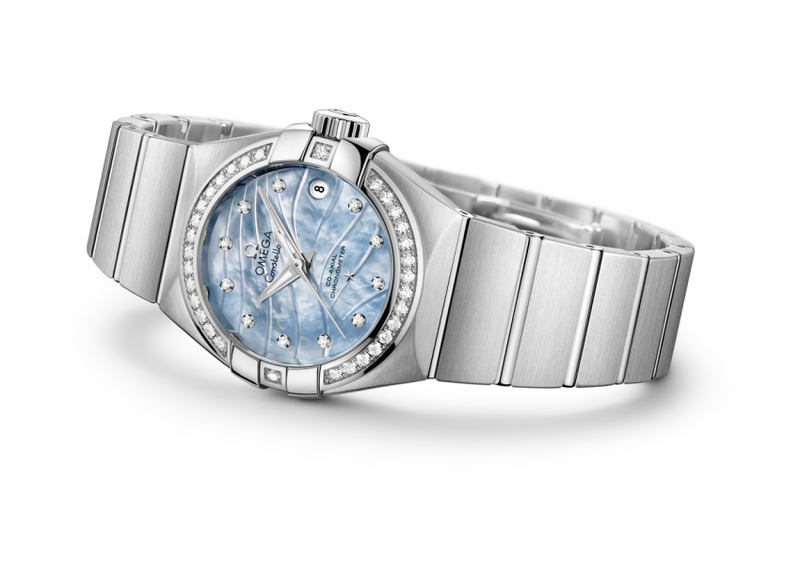 At the 2014 Baselworld, OMEGA will present their latest addition to the Constellation collection, the “Pluma” that took its name from the Latin word for feather. The design of this timepiece is inspired by the softness and shape of a bird’s feather. Among the most striking design elements of these 27 mm models are their mother-of-pearl dials that are available in natural white or blue – a hue that is created by coating the underside of an white mother-of-pearl piece with black paint. A soft, wavy pattern cast from the iconic claws on the bezel is engraved on the dial and recalls the gentle lines of a feather. The dial is further decorated with eleven diamond indexes, diamonds that are also found on the bezel. There will be two versions, one with stainless steel case and bracelet, as seen in the photo and a second version with 18K red gold bezel and stainless steel bracelet with red gold links. AS with the rest of the Constellation line, inside the watch you’ll find ticking a reliable OMEGA Co-Axial calibre 8520. The watch comes with a full four-year warranty and it’s water resistant to 10 bar (100 metres / 330 feet).